Preheat oven to 350 degrees F. Grease two cookie sheets or line with parchment paper or a silicone baking sheet. In a medium bowl, beat butter and sugar until light and fluffy. Add in eggs and vanilla and beat. Sift flour, cinnamon, baking powder, and salt. Combine flour and butter mixture. Stir in ¾ cup of the walnuts and orange zest. Divide dough into two equal parts and place one on each cookie sheet. Flatten out to about ½ inch thickness. Bake for about 30 minutes in preheated oven, or until edges are golden and the center is firm. Remove from oven to cool on the pans. When loaves are cool enough to handle, use a serrated knife to slice the loaves vertically into ½ inch thick slices. Return the slices to the baking sheet. Bake for an additional 10 to 12 minutes, turning over once halfway through. Melt chocolate chips and oil. 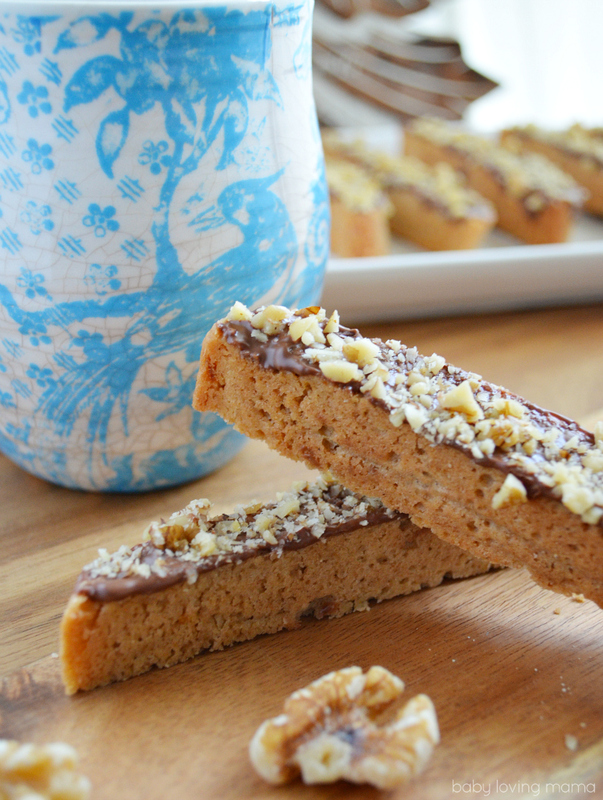 Spread chocolate over one side of biscotti. Sprinkle remaining chopped walnuts over the top. Allow to dry at room temperature.